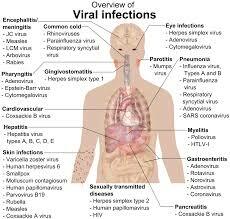 What is Viral Infection ? A viral Infection is a disease that can be caused by different kind if viruses, of which the influenza-virus is best known. A viral infection can be in different places in the body, some viruses are mainly in the intestine, while others prefer the lung and airways.With a viral infection you usually have a fever etc. 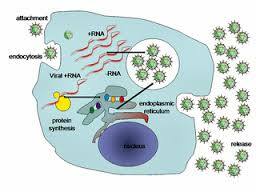 Viruses are small particles of genetic material (either DNA or RNA) that are surrounded by a protein coat. Some viruses also have a fatty "envelope" covering. They are incapable of reproducing on their own. Viruses depend on the organisms they infect (hosts) for their very survival. Viruses get a bad rap, but they also perform many important functions for humans, plants, animals, and the environment. For example, some viruses protect the host against other infections. Virus is refer to be transmitted from one person (or host) to another. Viral infections are contagious for varying periods of time depending on the virus. An incubation period refers to the time between exposure to a virus (or other pathogen) and the emergence of symptoms. The contagious period of a virus is not necessarily the same as the incubation period. Wash Your Hands. Frequent hand washing helps prevent transmission of illness. A cold virus on your hands can stay alive for up to three hours. If during that time you touch your eyes or nose, you could become infected. Aking a painkiller, such as paracetamol (eg Panadol) or ibuprofen (eg Nurofen), to bring your temperature down. Vaccines have been developed against most viral diseases. Herpes Simplex Virus-1(HSV-1) is the common viraus that causes cold sores. It's transmitted through saliva by kissing or sharing food or drink with an infected individual. Varicella-Zoster virus(VZV) causes itchy, oozing blisters, fatigue and high fever characteristic of chickenpox.The chickenpox vaccine is 98% effective at preventing infection. Hepatitis A is a virus that affects the liver for a few weeks up to several months. Rotavirus causes servere, watery diarrhea that can lead to dehydration. Anyone can get rotaviraus, but the illness occurs most often in babies an young children. Human immunodeficiency virus(HIV)is a virus that affects certain types of T cells of the immune system. Progression of the infection decreases the body's ability to fight disease and infection, leading to acquired immune deficiency syndrome(AIDS). Viral infection is common amid children as compared to adults. This is because, the immune system of a child is not as strong as that of a grown up and hence, the infection persists for a longer duration in their body. It is imperative that small babies and children should rest when they are affected with viral infection. Parents Should also use hot steam to loosen the mucus in child's nasal passage and chest.